If you’re like me and ready to take a break from all the super-sweet treats that are everywhere right now, but still want to get your seasonal pumpkin fix, I have just the thing for you. This warm and savory soup is full of the flavors and aromas you love about fall. Perfect with a salad for an easy lunch, this soup would also fit right in as a first course to Thanksgiving dinner. In a large pot over medium heat, melt the butter then add onion and leek. Cook, stirring frequently, until vegetables are softened and fragrant, 3-5 minutes. Add all remaining ingredients, except for the coconut creamer. Stir to combine and bring mixture briefly to a gentle boil then reduce the heat to low. Allow soup to simmer 15-20 minutes, stirring occasionally. Remove from heat and discard bay leaf. 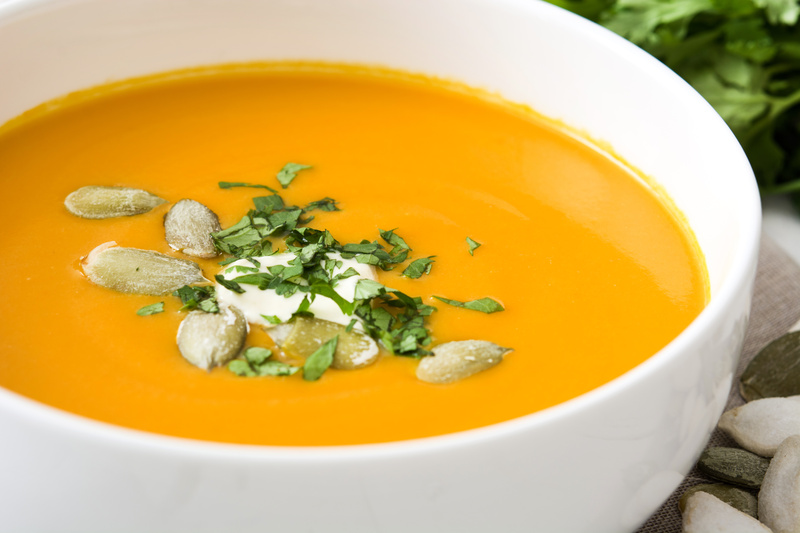 Use an immersion blender to blend soup until smooth, or to desired consistency. Gently stir in coconut creamer and serve warm.